Congratulations to Jason Riner, winner of a brand new iPhone 7. 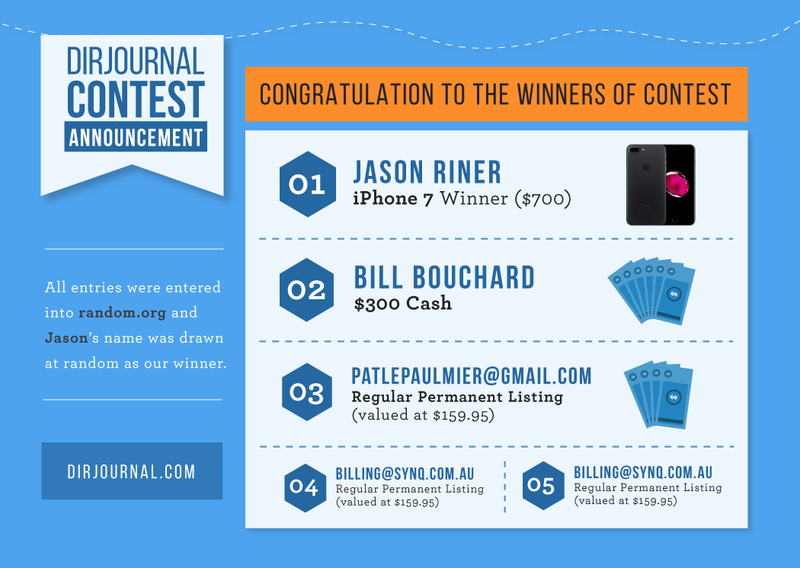 Jason is one of many entrants who submitted to DIRJournal with the coupon code DJTurns10. All entries were entered into random.org and Jason’s name was drawn at random as our winner. You missed our drawing, but you can still get in on the benefits of listing your business in the DIRJournal Business Directory or joining our Affiliate Program. I just wanted to thank you guys again for the prize as well as your outstanding customer service with getting our websites into your directory. I cannot speak highly enough of how great your website and team are. I never win these types of things, so this was a big surprise! You made my week. All the best to you and we’ll be in touch in the near future with more websites to add!